One man was killed Thursday morning after the vehicle he was driving crossed the centerline, resulting in a head-on collision with another vehicle near Snohomish. 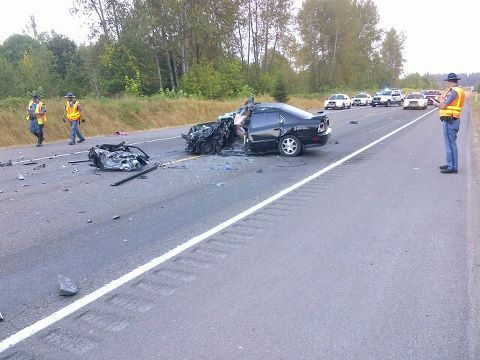 According to the Washington State Patrol (WSP), a man driving a black Honda was westbound on Highway 2 near the Snohomish area at approximately 6 a.m. Thursday when the vehicle crossed the centerline. The Honda then collided head-on with an eastbound blue pickup truck that was carrying two men. The men, a father and son who have not been identified, were injured in the crash and taken to Providence Colby Medical Center in Everett. The father was later transferred to Harborview Medical Center in Seattle due to the extent of his injuries. The man driving the Honda was seriously injured in the motor vehicle accident and was taken to Harborview Medical Center, where he later died from his injuries. WSP troopers say the man driving the Honda was not the registered owner and there was a screwdriver found in the ignition, suggesting it had been stolen.